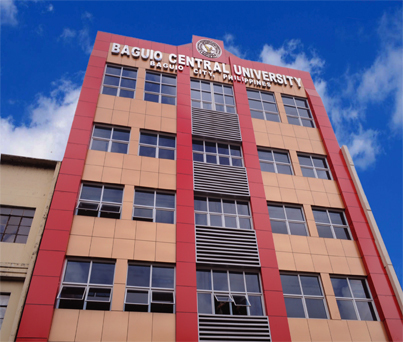 Baguio Central University (BCU), a non-stock corporation, was founded by the spouses Godofredo Fernandez and Margarita Fernandez in 1945 as a vocational school named Centro Academy. Later in 1949, it added a high school academic program and was named Centro Industrial School. With an aim to provide a wider scope of educational training and to meet the demand of the growing region, the vocational school which was under a single proprietorship, was turned into a private corporation. In the ensuing years, the school started to offer college courses leading to the different undergraduate and graduate degree programs – Bachelor of Arts, Bachelor of Secondary and Elementary Education, Bachelor of Science in Business Administration, Bachelor of Science in Public Administration, Bachelor of Science in Civil Engineering, Master of Arts in Education, Master in Public and Business Administration, Doctor of Education – to name a few. It was during these years of development when the institution was named as the Eastern Philippine Colleges and later on renamed Lyceum of Baguio. On August 15, 1977, the institution was granted its university status and became Baguio Central University, making Dr. Margarita J. Fernandez as the 1st University President. However, the lingering illness in the later years of Dr. Margarita Fernandez paved the way for the installation of Mrs. Margarita Cecilda B. Rillera as the 2nd University President in an investiture held in December 2011 and is serving concurrently as the Chairman of the Board of Trustees. The Vision of the University is “Education for all in the spirit and atmosphere of liberty, justice, truth and equity” while its mission is “To endeavor for excellence in human development”.